Width - Applied for wysiwyg editors. If not using a wysiwyg editor this option only applies to Joomla 2.5 sites, for Joomla 3 sites the Bootstrap class assigns the textarea width. Height - If showing a WYSIWYG text area then this value refers to the height of the editor in pixels, otherwise it refers to the height of the text area in the number of lines. Note: the wysiwyg editor will not load in an ajax opened form, instead the standard textarea is loaded. Show max limit - If yes selected then the user is limited to typing a certain number of characters into the text area (the value of which is defined in the 'Maximum length' field). 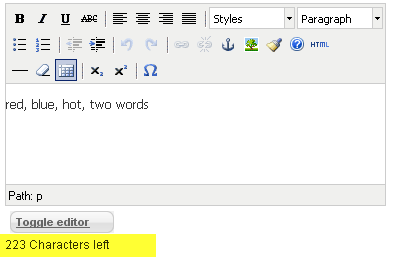 As the user types a piece of text under the checkbox informs them as to how many characters they have left. Each link has the class 'fabrikTag' applied to it - this allows for the tag icons to be shown to the side of the link. Truncate size - The number of words to show in the table view. If set to 0 all words will be shown If more words exist than the specified truncate size then the extra text will be truncated, but visible as a tooltip when the user hovers their mouse over the truncated text. Please note that textareas follow the filtering rules applied to the user's group in Joomla's global configuration section - see here for the Joomla documentation on textarea filters.